Squinting my eyes to see the pace clock's red hand to tell me when to start my next swim set. Worse yet, having to take off my darkly tinted goggles all the time to be able to see the clock is just plain annoying. All I want is to enjoy my swim workout without having to come out of the water with a headache from constant squinting. Don't even get me started on my open water and triathlon races. Without proper vision, it is plain impossible to have a good and efficient open water swim as I end up swimming in a zig zag since I can't see the landmark I am aiming for and I end up spending too much time lurking around and squinting to find the turning buoy. I am sure that those of you who wear prescription glasses or contact lenses on the dryland can relate to some of the experiences I have had. There is, however, one solution to the swimmer eye sight problem which is, in this time of modern technology, accessible to almost everyone: "laser eye surgery". Jason is here to tell us more about how the swimming community can benefit from laser eye surgery and how it is actually not that expensive an investment as one might think. Bad eyesight keeping you from swimming well? This is a guest post from Jason Sanderson, an extremely keen swimmer who uses the sport as a great way to keep fit and healthy. He often seeks to compete in local events around him and enjoys the social aspects that have appeared with his local sporting club. One of the unexpected advantages of laser eye surgery is the freedom it can give to dedicated swimmers. 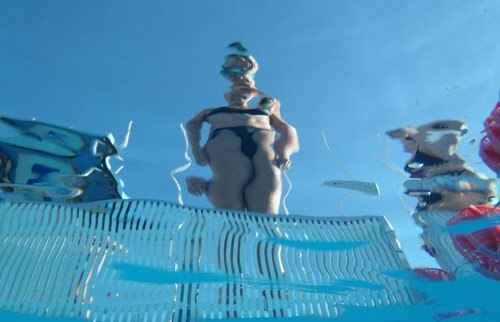 More than 10 million people enjoy swimming in the UK, and many, many millions more around the world, but having poor vision can often spoil your enjoyment of the sport. If you can’t see to the end of your lane, the landmark or buoy during your open water swim, your pulling away competitors during triathlon swims, your coach, the pace clock or even the scoreboard, it’s very difficult to be ahead of the game, particularly if you swim competitively or plan to join the ever popular triathlete crowd. Swimming in contact lenses is not generally recommended due to the high chlorine concentration in the pool water and open water bacteria which can cause eye infections in soft lenses. Furthermore, it is quite easy to lose a contact lens in a swimming pool and pretty much impossible to find it again. Many swimmers with poor eye sight wear prescription swimming goggles. However, these can be uncomfortable if worn for long periods of time and in the long-term can prove more expensive than laser eye surgery. Furthermore, if prescription swimming goggles are for some reason lost or stolen, unless there is a spare, your swimming race is over. The price of prescription swimming goggles range from approximately £25 ($40) for standard prescription goggles up to £250 ($400) for custom-made bifocal goggles. You may also have to pay extra for anti-fog treatment. Optometrists generally recommend an eye test every two years which could potentially mean replacing your goggles every two years. You may want to do this anyway for hygiene reasons. So, a 30 year old swimmer changing his/her averagely-priced £150 ($230) swimming goggles every two years will have spent a whopping £3,000 ($4600) on prescription swimming goggles alone by the time he/she reaches 70. This is in addition to his/her regular eye tests and prescription glasses. For around the same cost he/she could benefit from laser eye surgery, which ranges from around £850 ($1300) to £1,900 ($3000) per eye. This not only benefits his/her sight during swimming endeavors but also throughout every other activity and task during his/her lifetime. 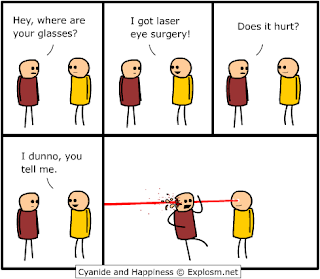 Laser eye surgery is usually effective, painless and over in just a few seconds. Recovery time is quick and you will be able to return to swimming in just four weeks. Most people achieve 20:20 vision after having the surgery and enjoy the rest of their lives without needing prescription glasses again. The process is simple and painless. Anaesthetic drops are placed in the eye and your eye lid is held open with a small speculum. Depending on whether you choose LASIK or LASEK surgery the surface of your eye is either cut to create a flap or softened to allow the laser to perform. The laser treatment takes less than one minute and your vision will return in just a few hours with complete recovery over a few days. Millions of people around the world have had laser eye surgery and the risks are very low. The majority of any complications arising from surgery are not serious and are easily treated. The risks include: discomfort following surgery, including dry eyes; eye lid droop which is rare and usually resolves itself within two weeks of surgery; corneal infection which is easily treated with antibiotics and eye drops; and over/under correction which is easily treated with a laser enhancement once your eyes have fully healed. There have been no reported incidents of blindness following laser eye surgery and any serious or long-lasting damage to vision is extremely rare. 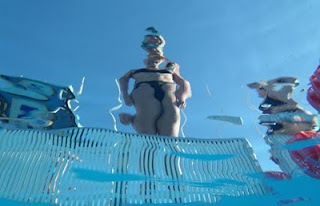 From Swimatog Blog: This definitely sounds like a career saver for a competitive swimmer. One of my friends who is a top level open water swimmer praises the laser eye surgery very much. When he first started open water swimming (a long time ago), he too wore glasses and struggled to see during his swims but, after he made the difficult decision to undergo the laser eye surgery, he never looked back. His career as an open water swimmer has taken off: he even represented his country (Czech Republic) in the 2008 Olympics in Beijing and is currently preparing for the 2012 Olympic Games in London. So, if you do have a less than normal level of eye sight and it causes you problems in and out of the pool or open water, why not find out more about what modern science can do for you. Laser eye surgery technology has been here for many years now, is undergoing constant improvements and, most important of all, getting affordable for us swimmers who would like to finally see :).